The historically rich Spanish city of A Coruna overlooks the Atlantic Ocean and is home to this 40-year old abode which was lying in a dated and shabby state previously. Old-fashioned designs, dingy spaces, and unappealing colours made this house an eyesore. 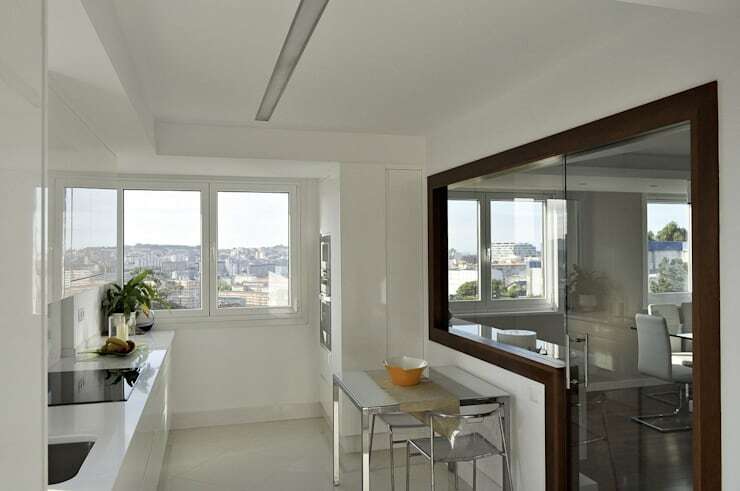 But with the creative and visionary efforts of the architects at Intra Architects, the renovated residence is a bright, airy and smart space with open plan layout, beautiful textures and elegant hues. 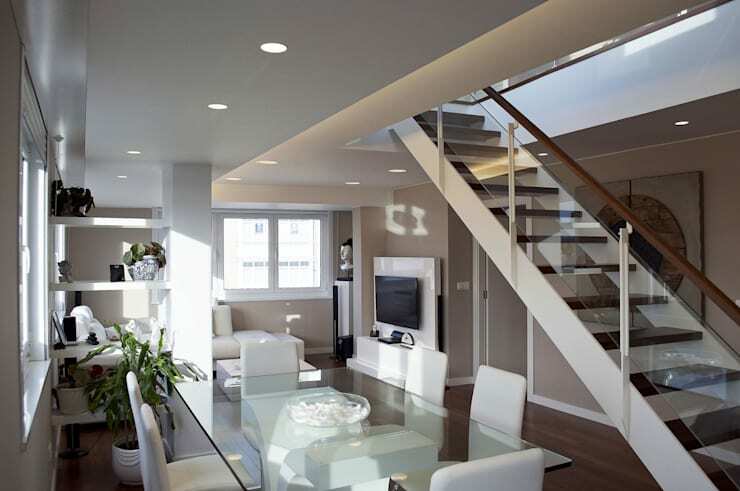 Trendy lights and clever use of glass add to its feeling of expansiveness and style. So read on to learn more about this makeover. 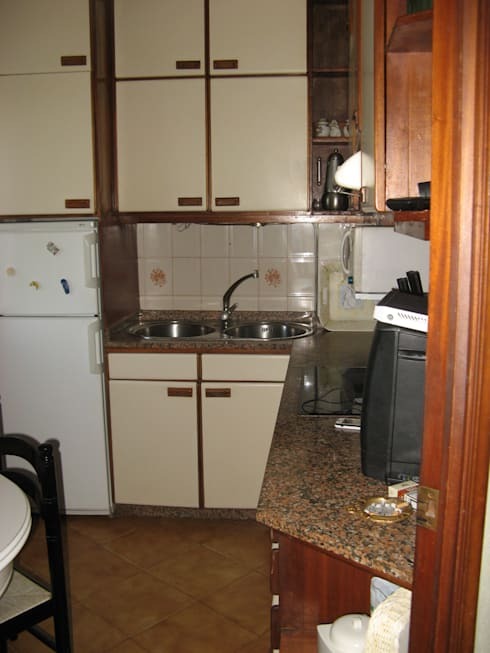 The white cabinets with wooden detailing seemed like a blast from the past, while the drab countertop and old-fashioned appliances made things worse in the kitchen. Bathed in pristine white, the kitchen is now an incredibly space with gleaming surfaces, ultramodern fixtures and a pretty casual dining arrangement in glass and chrome. Sunlight through the large windows fills the area with cheer, while a fashionable glass door and window on the right integrates the kitchen with the formal dining space. 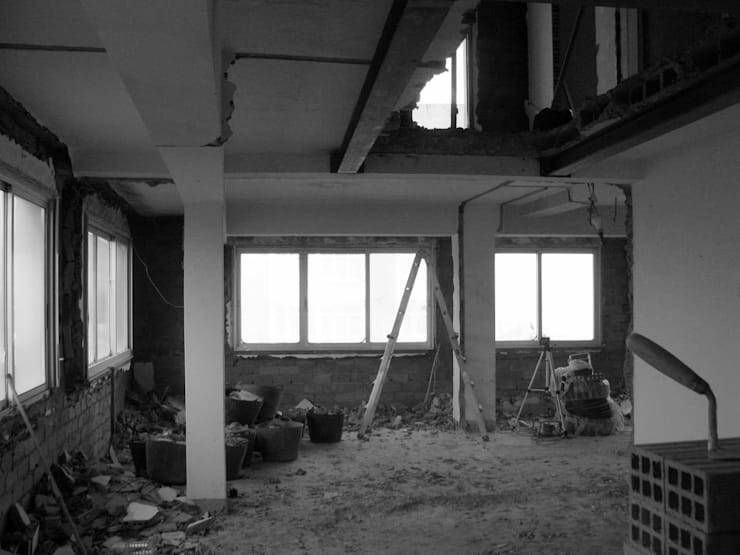 Some internal walls had to be pulled down to make way for an open plan layout so that the house could look more expansive. The architects also decided to introduce a more stylish staircase to connect the floors. The main hall now comprises of the living and dining areas comfortably, while the sleek wood and white staircase comes with glass balustrades to reinforce openness in the residence. 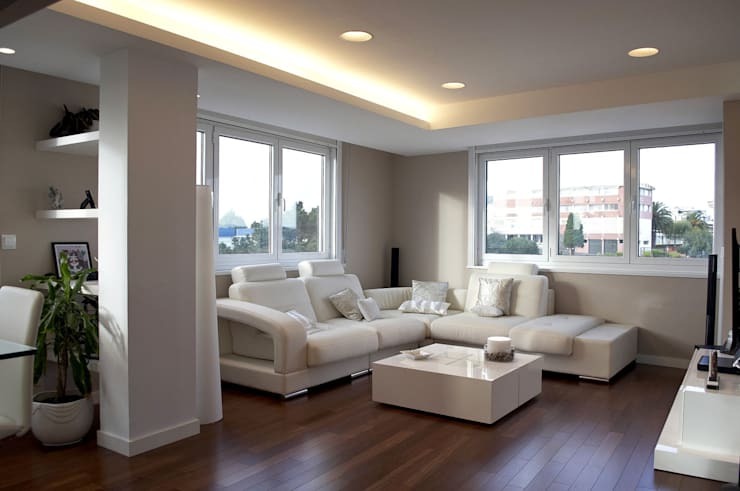 White is the dominating hue in the hall, accompanied by splashes of beige and a wooden floor. We also love the glass-topped dining table which seems to float in air, while modish white chairs accompany it closely. A fashionable and plush white sectional along with a trendy, glossy coffee table is the object of attraction in the simple but stylish living area. Silvery cushions and a mix of recessed and concealed lighting add subtle pizzazz here. The large windows allow you to catch a glimpse of the cityscape and allow adequate fresh air and natural light to enter the home. 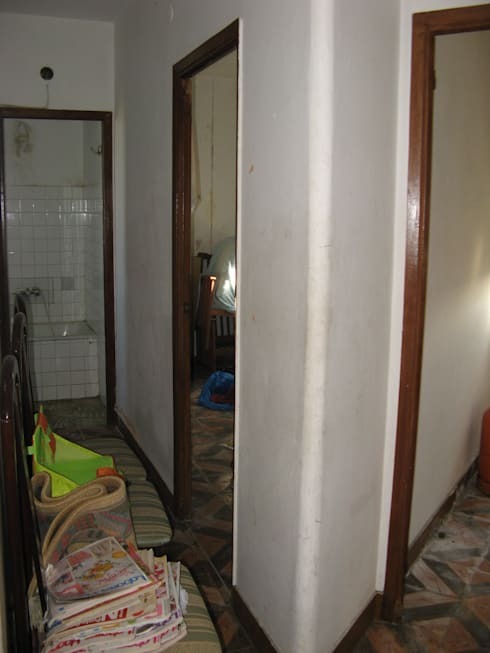 Prior to the makeover, the corridors in this house were dingy and shabby affairs with ageing walls, worn-out flooring, and cramped with unnecessary clutter. Dark and sophisticated wood now lines the corridor floors and contrasts their white environs nicely. 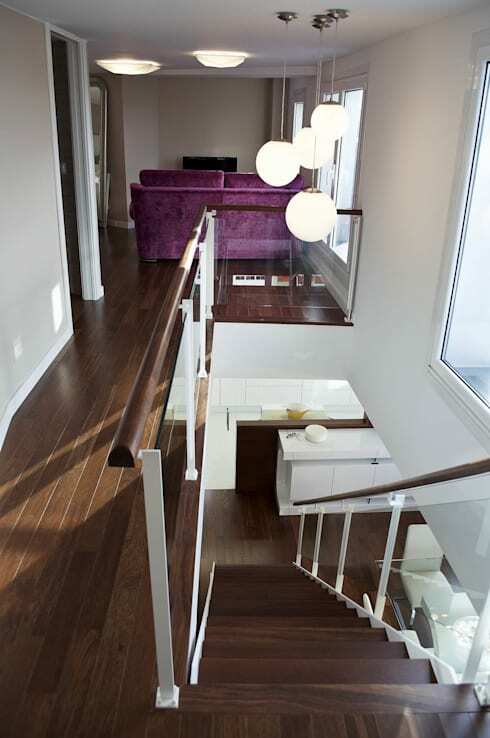 This staircase and landing with sleek wooden and glass touches especially stand out under the chic globular pendant lights to make a unique design statement. 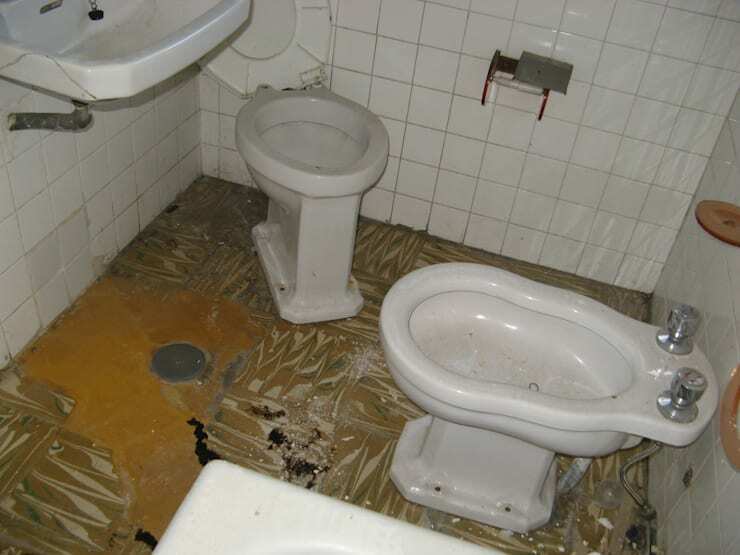 Terribly dated sanitary wares, chipped and grimy tiles, and a ripped up floor made this bathroom a nightmarish vision. 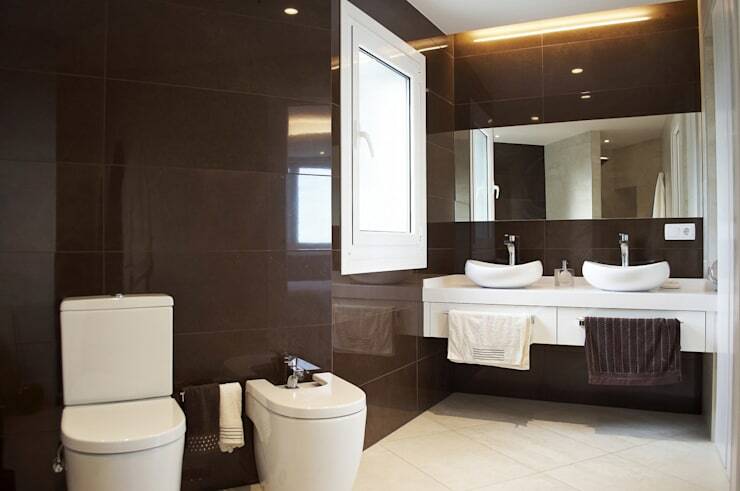 With chocolate brown tiles on the walls and beige ones on the floor, the bathroom is now a rich and glossy space to bathe, energise and get ready for the day. The chic sinks, sleek cabinet, white and glass window and avant-garde fixtures stand out elegantly against the brown canvas, while a long mirror lends the illusion of additional space. This makeover is an inspiration with its focus on the right colours, rich textures and smart furnishing. Here’s another before and after story for more ideas - 5 Remarkably Renovated Kitchens.